The recently completed modernisation by GE and CEFLA of ACEA’s Tor di Valle combined heat and power plant in Rome marks the first time that GE’s J920 FleXtra technology has been selected to modernise an existing power plant. Also, the two 50 Hz 9.5 MWe J920 FleXtra engines operating at the site are the first such machines to go into commercial operation in Italy. 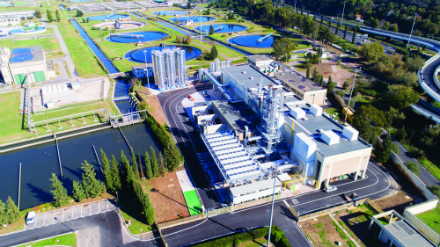 The main role of the new combined heat and power plant is to supply heat to about 40 000 residential customers in Rome, while electricity is to be supplied to ACEA ATO2’s adjacent sewage treatment plant, with surplus electricity exported to the power grid. The modernised CHP plant was designed and delivered (ahead of schedule) by a consortium made up of GE and CEFLA, with GE providing the Jenbacher J920 FleXtra generator sets, related engineering and associated balance-of-plant equipment. CEFLA developed the engineering aspects of the plant, providing project management, ensuring plant supplies, and was responsible for all plant installation work, including the civil infrastructure. As well as the two J920 FleXtra CHP units, the new facility includes three auxiliary gas boilers and associated systems for the district heating supply. In addition to the 19 MW of electrical power the engines are able to produce about 15 MW of heat, with the facility capable of achieving more than 80% total efficiency. The three additional gas boilers are designed to produce another 70 MW of heat to cover peak heat load demands, while six thermal (hot water) storage tanks (200 m3 each) are also included to allow heat to be buffered for off-peak demand. The combination of gas engines producing power and heat with heat storage and gas boilers significantly reduces the environmental impact of the new cogeneration plant relative to the old facility and renders it much more efficient than the power plant it replaced. Interestingly, in the Tor di Valle, case the reciprocating engine based CHP plant has replaced a gas turbine based combined cycle CHP plant, in operation since 1997, fully operational since 2000, initially designed primarily for baseload electricity production. The combined cycle plant, 125 MWe, with 70 MWt of steam extraction for district heating, consisted of two Frame 6 gas turbines (each with a heat recovery steam generator), plus a steam turbine. Elsewhere on the site is a CHP plant that started up in 1982, supplying the district heating system built by Acea in 1984. With an installed capacity of 24.5 MWe/44 MWt this CHP plant consists of a Frame 5 gas turbine, three auxiliary boilers, and six hot water storage tanks. Power market conditions, notably the increased presence of renewables on the grid, have militated against the continuing operation of the combined cycle based cogeneration facility. In particular, flexibility of operation and the capability to reach full load in just a few minutes, are becoming pretty much essential requirements for modern cogeneration plants, together with reduced environmental impact and high efficiency. For these reasons it was decided to go for a radical renovation at Tor di Valle, replacing the gas turbine based combined cycle plant with a reciprocating engine based facility. Another driver was the need to adapt building structures to meet new regulations, with particular reference to earthquake standards. The new Tor di Valle CHP project includes a multiyear service agreement for the two J920 FleXtra engines. GE’s myPlant* Asset Performance Management system will actively monitor all key engine parameters, with myPlant analytics able to predict component life, allowing operators to move from a proactive maintenance schedule to a condition based maintenance approach. “In Europe, we are seeing rising demand for more flexible energy systems in the CHP segment and for the modernisation of existing gas- or coal-fired cogeneration power plants under the European climate policy,” said Carlos Lange, president of GE’s Distributed Power business.